I studied abroad in Paris almost 10 years ago next February! I can’t believe that it has been that long, time seems to have gone by really fast. I studied with the International Studies Abroad program and studied at L’Institut Catholique de Paris during the Spring Term 2008. I lived in a home stay; my host mom was born in China, raised in La Reunion (off the coast of Africa near Madagascar) and has lived in Paris for the past twenty or so years. I had an American roomate too plus a third roomate who changed every month or so. 1. Paris is considered to be one of the top tourist destinations and is also a top study abroad destination. 2. There are many other foreign students studying in Paris; this is one of the best opportunities to meet other people and speak French. 3. Living with a host family gives you an exclusive look at the French culture and customs and provides another great opportunity to speak French on a daily basis. 4. Paris is the city of light, but also love. 5. Paris offers a wide range of places to visit and explore: museums, religious institutions, parks and markets. 6. Paris was the place where many historical figures lived and worked: Toulouse Lautrec, Victor Hugo, Napoleon, Albert Camus etc. 7. Paris is particularly beautiful in the Spring or Fall. 10. The Eiffel Tower is always in sight (yes, even where I live, 16 kilometers away). 11. You can watch indie or popular movies in a small, one screen cinema or in a multiplex cinema. 12. You can pick up on French slang words easily because you will notice that most people speak familial French (not the French you learn in school). 13. There is always a neighborhood market to explore to find colorful food or little treasures for small to large prices. 14. There are plenty of day trips to take outside of the city, like Monet’s Garden or Versailles, and public transportation can have you home in time for dinner. 15. Paris is always an adventure – sit back and relax in a café, enjoying a conversation with friends, or listening to someone else’s, or people-watch in the street. 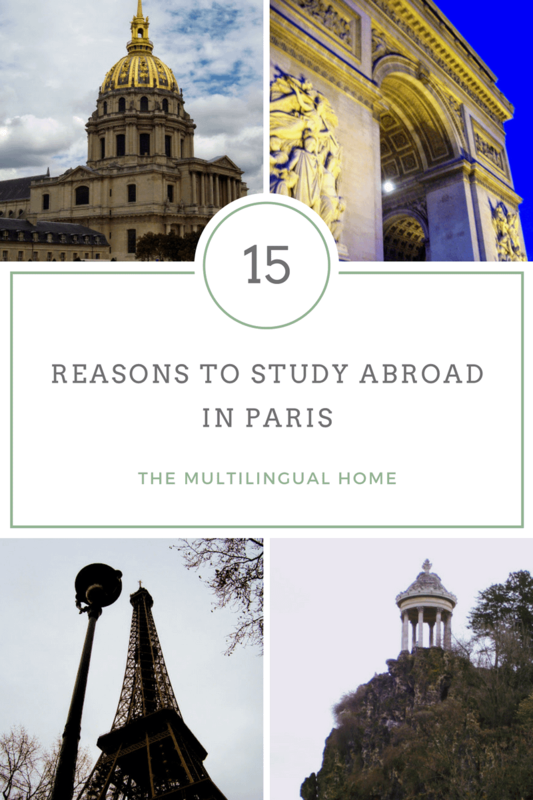 Have you ever studied abroad in Paris or elsewhere ? What would you add to the list ?